breath * life * flow: happy birthday, america! fireworks, friends, food, and a day to celebrate our freedom! i love everything about the 4th of july. for us, it's just a chill family day. something for everyone. sparklers for the kids and the big guns for us who still like to think we are kids. the weather seems to cooperate and the food is always great be it you like hot dogs and burgers or something more fancy like a lobster bake. everything tastes great amongst family and friends. 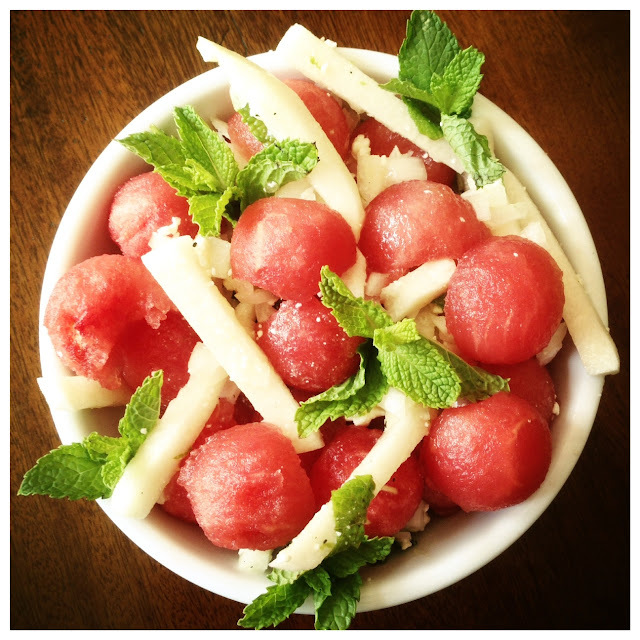 my team in the office was talking about a fabulous watermelon salad that chloe's sister made and tyler tried. with knowledge of the basic ingredients, i set off to put my personal twist to it. adding some unusual items while guessing on others. it turned out amazingly if i do say so myself. actually, my husband was my taste tester and he oohed and ahhed with each and every bite. it was immediately evident i had a winner on my hands. yay! it's so simple but incredibly refreshing. whisk together juices, honey, salt + pepper and pomegranate red wine vinegar in a large bowl. add the remaining ingredients and toss to coat. garnish with tops of mint leaves.